This past Sunday, April 30, 2017, on the last day of African Vaccination week, Special Olympics Senegal (SO), alongside Lions Clubs International Foundation (LCIF) and Speak Up Africa (SUA), hosted a football match in one of the most densely populated urban areas outside Dakar. 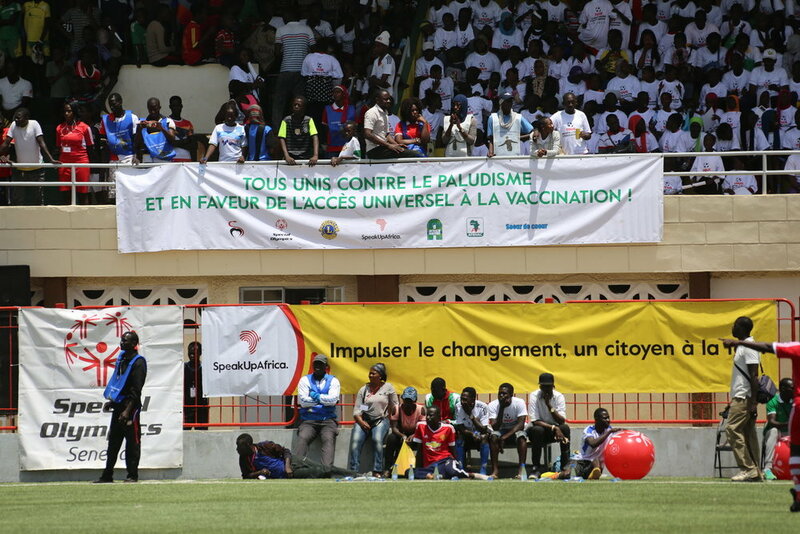 This high profile event was branded, “All in Support of Universal Immunization and United Against Malaria”, took place in Pikine, Senegal at the Alassane Djigo Stadium. More than 750 people attended the game, which featured 22 football teams. This match marked the end of the 7th annual African Vaccination Week (AVW), – a week dedicated to the promotion of the importance of universal access to vaccination… Since vaccination is one of the most cost effective, life saving health interventions, there is a need to increase consumer knowledge that vaccinations need to be up to date at every point in a person’s life for full protection against diseases. Two diverse and unified teams included the Zero Malaria team in red jerseys and the Vaccination team in green jerseys. Both teams were comprised of Special Olympics athletes, children, players from the women’s national team, community actors, mayor’s representatives, members of the various associations of Pikine, and our very own Abdoulaye Diop, who is Speak Up Africa’s Malaria Program Manager. The crowd cheered drummers of the neighborhood’s local soccer team as they put on a vibrant performance. During half time the crowd was entertained by a performance from the neighborhood’s rugby school, which performed a Haka dance, a traditional dance from New Zealand. In attendance of this exciting event were officials from the local health authorities, youth associations including the Young Entrepreneurs of Senegal, the“Going on Our Own” Movement, the Association for Well-being and Solidarity, women’s groups, Special Olympic athletes, coaches and partners, including, Afrivac, PATH, and Soeur de Coeur. Special Olympics Country Director Rajah Sy and board member Moustapha Tamba, were all in attendance. Additionally, Senegalese artist, Mansour Mbaye Madiaga who is well known for his role as « Père Zora » in a series called “Wiri, wiri”, attended the event, which excited the crowd. 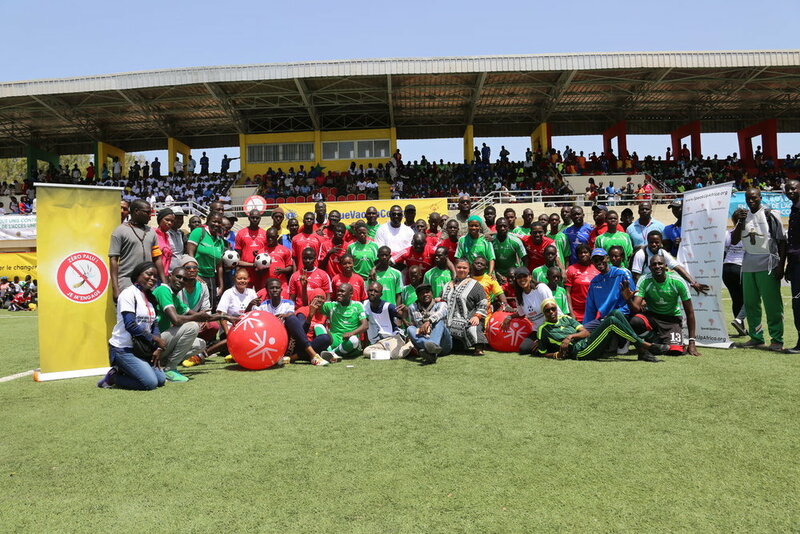 Special Olympics Senegal, LCIF and Speak Up Africa were excited to host this inspiring event, commemorating the end of African Vaccination Week, which so very clearly fit within our collective mission to transform lives through sports.